Some of you might laugh at the title of this thread and think “how the hell can taking a break allow me to get more work done? He’s insane!” But there is hard backed evidence that taking breaks not only makes you more productive, but happier and smarter as well! Let me walk you through it..
Firstly, breaks help refrain you from becoming bored or unfocused with your work. I’m sure we’ve all had a time when we simply looked at the work we had to get done and just gone over to Facebook or Reddit instead. And then we think, “ohh, I really should get some work done” and we do a little more half-assed work before catching ourselves goofing off again. Well how about instead of that just take a proper break and do something active, then sit down after 10 or 20 minutes and get stuck into it again. Another important factor in taking breaks is that they actually help us remember the information we’ve just learned. Have you noticed that you often get ideas or breakthroughs when you’re in the shower? Or just before bed? That’s because our brain uses this ‘relaxation’ time (also known as Diffuse Mode) to try and solve some of our toughest problems. And finally, breaks help us re-evaluate the direction that we are taking. When you focus on a task for a long period of time we often lose ourselves within it and may even start focusing on unimportant tasks. So taking a break allows us to step back for a minute and clear our minds, we can think about our overarching goals and re-evaluate what we are currently working on. So there you have it, taking breaks helps us in many areas of our work. Try it out, take a break when you find yourself getting frustrated or if you’ve been working for over 2 hours and you won’t regret it. If you learned something new here please give it a thanks or if you have any questions just write a comment! 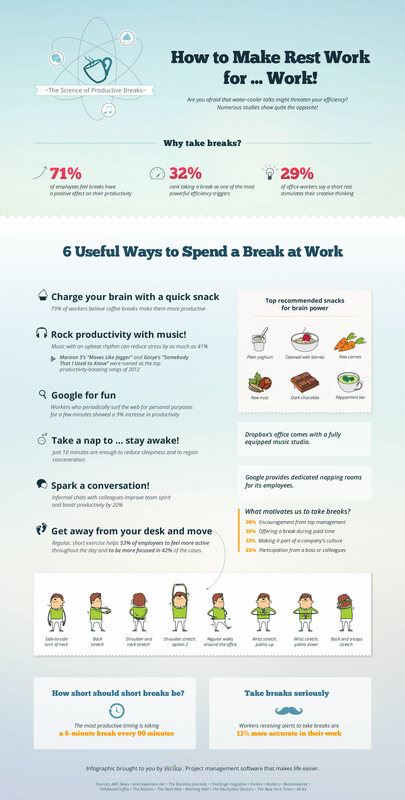 EDIT: Thanks to WrikeAffiliate for adding this little infographic about taking breaks at work. I find this to be so true. I remember some time ago I read an article saying the same thing. The premise behind it is that everyone has their own "breaking point" and can truly only work effectively for a certain amount of time. Some people it may be 30 minutes... others it may be 3 hours but no matter what everyone needs to take breaks. It's one way our bodies can provide more fuel for the fun. Want to learn how to EFFECTIVELY advertise online? Check it out! True. Taking breaks really helps a lot in terms of creativity, focus and productivity. I like to take a break and meditate for 5 minutes. I Will Send $500 To Your Paypal Account If You Don't Make Money With This. Guaranteed! That is an open secret for people who are still doubting. When fatigue sets in, you will just be wasting your time trying to do any serious job. Rest as much as possible before you continue. A break does not necessarily means you leave your desk. Just something unrelated to what you have been on. My day includes one big break and I'm done with it. I only work once per year and then it's all about passive income. I have succumbed to a supreme force in exchange for liberty. Day after day I meditate and everything is taken care of. I am hypnotized 24/7. My break lasts for a month until I occasionally churn out a newsletter for my followers. I strive to remain one of the most laid back people in the world. People pay me dividends so I can sit pretty on a large wad of cash. My sole "job" is to meditate and connect with future events that I manipulate with my subconscious. Welcome to 2015. Everything is made to run on auto-pilot and I see no reason why I should slave-away to a pathetic job. Yep, I smoke mary janes, ride my bike and the universe is my sidekick. More people should stop working, meditate and taste the flavors of life. Someday you'll leave your physical existence so start taking long breaks and only work when you feel so. I usually try to squeeze in a bit of meditation or at least some quite time during 1 of my breaks per day. Then in another break I try to get a bit active and take the dog for a walk or do 100 push ups. That's a really interesting idea that I am actually trying to work towards. Although I need to put in the hard yards now so my site can gain some traction and a following I would like to eventually have enough back pocket money to just do my own thing and focus on not only improving myself but helping others. Visit Kaizen-Creative.com for free productivity hacks you can use right now! With my degree in Psychology I've made sure it's packed with all sorts of strategies and studies for increasing human efficiency naturally. Stop getting distracted and Work Smarter, Not Harder. Spot on post Zach. I "meditate" while taking a shower, it makes me relax as it helps me quell my busy mind. Long breaks can help recharge the batteries so to speak to assess your work before finalizing it and putting the finishing touch. The Pomodoro time management method allows you to take long and short breaks every 25 minutes. I love it because 5 or 10 minutes is just enough time for me to decompress. I actually find myself finishing more tasks in a short amount of time when I take long breaks. Couldn't agree more with you on taking frequent short breaks, I was basically frying my brain working 4-5 hours straight not too long ago! One of my writing teachers studied a lot about the brain to maximize his output, and he swears by working in 45 minute blocks. Because our society runs on the hour, we're trained to work for an hour and then "be done" or at least tired of doing the same thing. If you force yourself to stop at 45 minutes, then take a 15 minute break, coming back to another 45 minutes is insanely easy. I also find that Hemingway had something going for him when he talks about writing and leaving a sentence unfinished. Taking an abrupt break allows your brain to anticipate the next thing subconsciously, often finding that "aha moment" and adding to the momentum, not slowing you down. Because our society runs on the hour, we're trained to work for an hour and then "be done" or at least tired of doing the same thing. If you force yourself to stop at 45 minutes, then take a 15 minute break, coming back to another 45 minutes is insanely easy. This is a really interesting idea that I've never thought of before. I might have to look a bit deeper into it. I try to take 5-10 mins break after every 2 hours of work. It does recharge your energy and surprisingly taking breaks increases productivity. For me though, taking breaks is not enough, I have to do things like meditation, deep breathing to get my mind free.. I use my breaks in two different ways. I either do some meditation or quiet time as you've outlined or a get up a walk around the house and do some stretches. What do you mean by 'taking breaks is not enough', couldn't your break be doing some meditation?